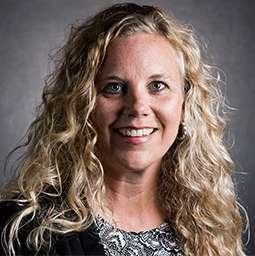 Katie Vesperman joined the College in a professional role in 2007 and currently serves as Associate Vice President for Institutional Advancement. Prior to joining the College, Katie served as Program Director for the Greater Madison Chamber of Commerce. She is a 1999 Edgewood College graduate from the School of Business. Her husband Mac graduated in 2015 from the Henry Predolin School of Nursing and currently serves as a pediatric nurse at the American Family Children’s Hospital. Katie is an active member of the Madison Chapter of the Association for Fundraising Professionals, Kiwanis, Wisconsin Association of Charitable Gift Planners, and is a graduate of Leadership Greater Madison. She currently serves on the Image and Development Committee for St. Vincent De Paul and is a member of the Alumni Advisory Board for the Cutting Edge program at Edgewood College. In her free time, Katie enjoys the outdoors, sports, and spending time with her family.